Community chorus practicing Monday for this weekend's shows on Saturday at 7 p.m. and Sunday at 3 p.m.
Nancy Luce, known as the “chicken lady of Martha’s Vineyard,” made a living in the 19th century by celebrating her beloved bantam hens with poetry and selling chicken-related souvenirs to tourists. Her gentle eccentricity has inspired generations of animal lovers and Island individualists over the years. 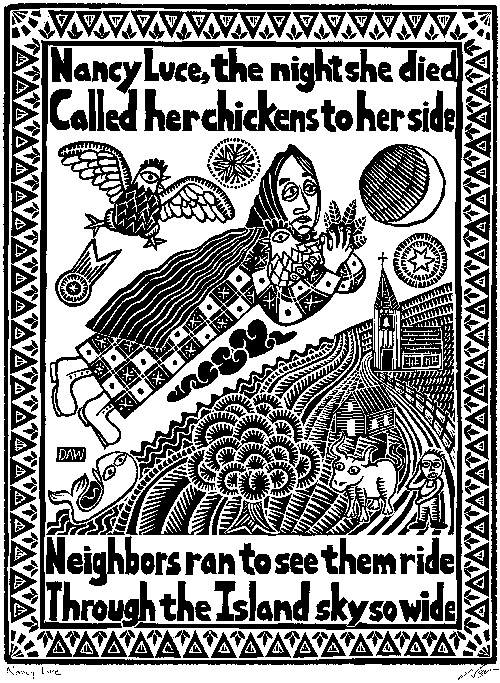 One is artist Daniel Waters of West Tisbury, Ms. Luce’s lifelong hometown, who created three block prints of the chicken lady and her hens. 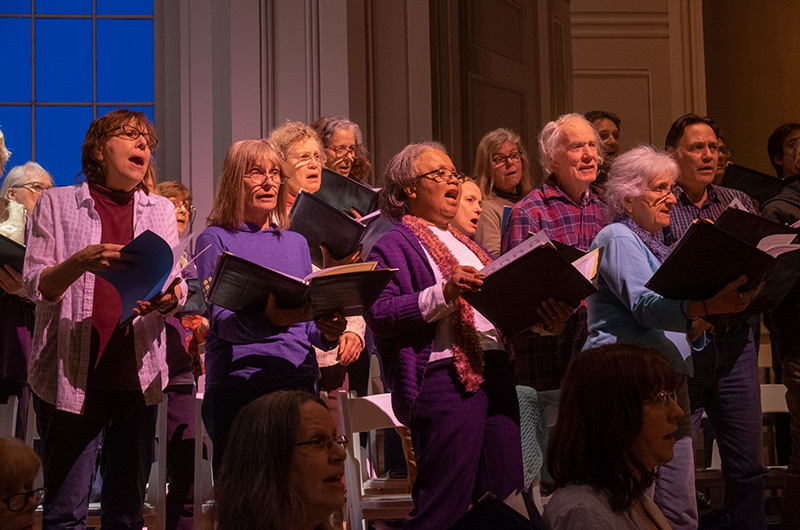 How one of his prints made its way to Philadelphia and into the imagination of a 21st-century choral composer is an unexpected tale that is still unfolding, as the Island Community Chorus premieres the cantata In Heaven, Hereafter, inspired by the life of Nancy Luce. 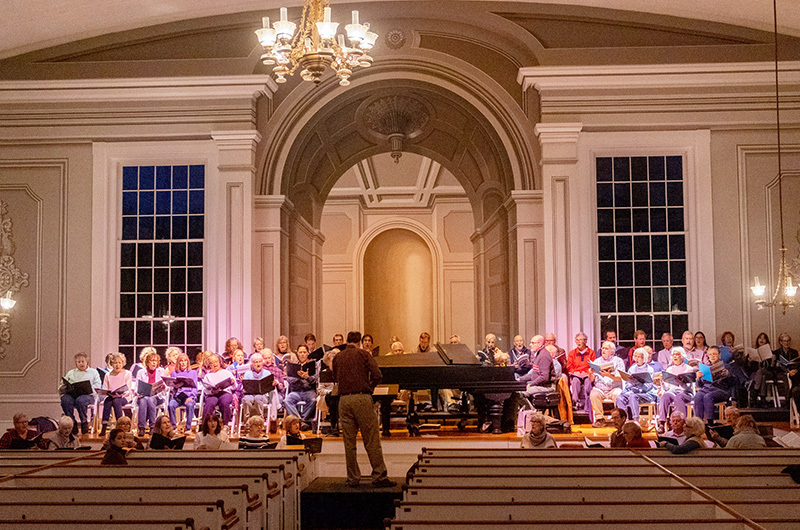 The performances are Saturday night and Sunday afternoon at the Whaling Church in Edgartown. Composer Thomas LaVoy, born 100 years after Ms. Luce’s death in 1890, had never been to Martha’s Vineyard or heard of its chicken lady when he spotted one of Mr. Waters’s prints on the wall of a relative’s home. 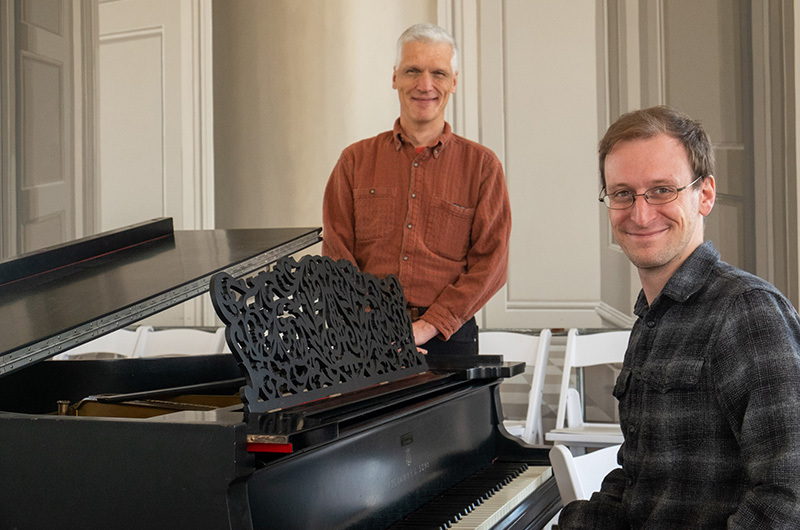 “It was the weirdest thing,” said Mr. LaVoy of the chance encounter in 2017, while he was pet-sitting in Philadelphia soon after receiving his PhD in composition from the University of Aberdeen in Scotland. Hanging near the piano where Mr. LaVoy worked daily to launch his career, the print captured his imagination so completely that he had to find out more. He looked up Ms. Luce’s life and poetry online, and took the image out of the frame for more clues. “We took it out of the frame and found Dan’s name,” he told the Gazette this week while on the Island preparing for the concert. Contacted by email, Mr. Waters was glad to show him around the Island when he arrived early last year. “Dan was amazing,” Mr. LaVoy said. “He took me to Nancy’s cabin and to her gravesite,” where the composer spent some time alone among the chicken figurines that fans still leave by her headstone. “It was very clear that he felt a strong connection,” Mr. Waters said. Mr. Waters also introduced him to Bow Van Riper, research librarian at the Martha’s Vineyard Museum, who showed Mr. LaVoy more of Ms. Luce’s writings. “There was stuff in there I hadn’t seen before—different versions that are not in the [online] collected works,” said Mr. LaVoy. This weekend’s concerts come at a poignant moment in the aftermath of the barn fire that killed more than 100 animals at Flat Point Farm last month. While Saturday’s 7 p.m. concert may lose some attendance to the farm benefit at the Ag Hall that night, Sunday’s 3 p.m. performance will give more Islanders a chance to hear the new work. The program also includes Fauré’s Cantique de Jean Racine, a Puccini work with guest violinist Rebecca Laird and Mr. LaVoy’s setting of the 121st Psalm, Neither the Moon by Night. Longtime chorus pianist Garrett Brown will accompany the singers and Ms. Laird. A reception will follow each performance. Lovely piece - thank you so much. I have a grandniece in Maine (an enthusiastic summer visitor to the Vineyard) who also has a very deep connection with her chickens, and they with her. I have purchased a number of Dan Waters' wonderful prints and cards, including several of those featuring Nancy Luce, and bought a recently published book on Nancy Luce from the Martha's Vineyard Museum. Wow. Stranger than fiction. I hope the choir records their performance so those of us off island can get to hear it. Shades of O.Henry and three cheers for Dan, Nancy, Tom, and the Island Community Chorus!